An Illinois state trooper prepares to approach the family of Trooper Brooke Jones-Story after her funeral ended in Warren, Ill. Troopers prepare to transport the urn of Officer Jones-Story following her funeral on April 3. Illinois State Troopers stand together after the funeral service ends. The parking lot outside Warren High School filled silently with officers from neighboring counties and states, including Texas, Missouri, and Louisiana. "Enough is Enough" flashed on electronic signs over some Illinois highways recently. That's because at least 16 state troopers have been hit on the road so far this year. The signs emphasize Scott's Law or the "Move Over" Law. It says motorists must slow down and switch lanes to give emergency vehicles space if they're stopped on the road side. Three troopers have been struck and killed this year while on the road. 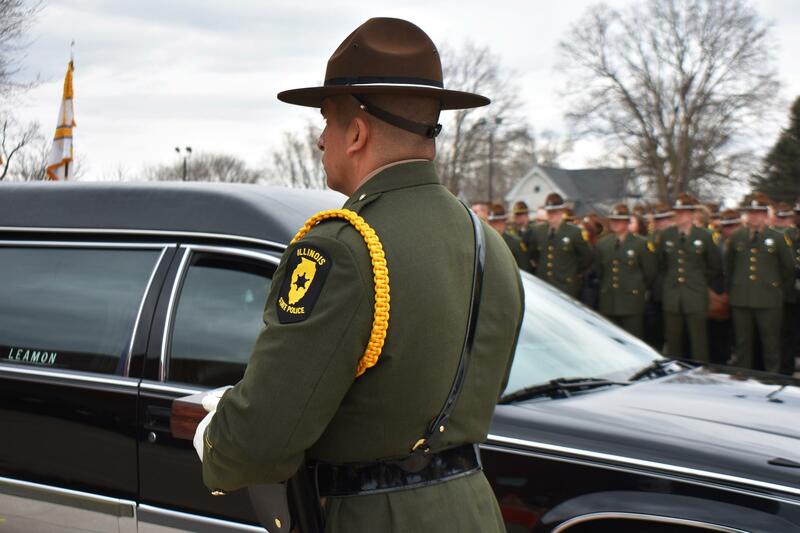 Illinois State Troopers are mourning the loss of their colleagues after fatal traffic accidents claim the lives of three troopers this year. Sarah Jesmer reports. Trooper Brooke Jones-Story was laid to rest Wednesday in Warren, Ill., after a funeral service in her old high school. She served in District 16 which covers the Pecatonica area. Gov. J.B. Pritzker joined hundreds in mourning and spoke directly to the troopers in attendance. "You are the best of us," Pritzker said, "and Brooke was among the best of you." Jones-Story was struck by a semi while at work on the roadside. She's the second trooper killed this year after a Scott's Law violation; the first was Christopher Lambert in January. A third trooper was fatally hit days after Jones-Story was killed, this time by a wrong-way driver. Trooper Gerald Ellis was laid to rest Friday in Lake County. The governor attended that service, too. Illinois has seen the nation's highest rate of traffic-related line-of-duty deaths in 2019, according to numbers provided by Officer Down Memorial Page. These deaths prompted new legislation to bolster Scott's Law, such as House Bill 2417 sponsored by state Rep. Tim Butler. The measure would turn a violation from a business offense to a petty offense, meaning no one would have to physically appear in court. "What I had heard from law enforcement was that people weren't writing tickets because it was a must-appear for the officers and the offender and things like that," said Butler. "Then the other part of it was it added a misdemeanor -- class A misdemeanor -- as part of the penalty if you cause bodily harm or get in a crash." Butler said Illinois needs more troopers on the roads than they allocated money for. "We need to make sure the public's educated," he said. "When you come upon a scene of someone on the side of the road, you need to slow down and need to move over, and we need to put the resources behind to make sure people know that." The state Senate is also trying to make roads safer by working to clearly define when the use of a phone or screen officially becomes distracted driving. Secretary of State Jesse White responded to trooper traffic accidents with a call to action for motorists to "protect those who protect us." "I think it's a violation of all laws of human decency for an individual to drive on our roads, not obey the laws that have been established, be distracted, driving while intoxicated, driving while texting or driving while they're impaired," said White. White notes a law signed during the Rauner administration will mean violators face more than a ticket. "Now, starting on July 1 of this year, individuals will get a punch on their license which means that after three moving violations, they could lose their license," he said. Every state has a "Slow down/Move over" law. One, Texas, has the most highways in the country. Drivers there must drop their speeds to 20 miles per hour below the speed limit if they're approaching a responding car on the roadside. If they can't slow down, they’ll have to switch lanes. Sergeant Ryan Howard works with the Texas Department of Public Safety. "If there is an injury, a bodily injury is involved, or a first responder gets hit or anybody gets injured, then it can be a Class B misdemeanor, where they can receive a fine up to $2,000 and face jail time," Howard said. He says Texan troopers campaign to bring awareness to their "Move over" laws through commercials, billboards, and what he calls "periodic enforcement operations." "We have troopers that get together. They say, 'Hey, you know, we want to work this area, we want to bring awareness to slow down, move over laws,'" Howard said. Howard says multiple troopers occasionally go out on the road together. One stops a car and the others watch to see if someone doesn't move over. "Now when it comes down to the actual traffic stops, I have stopped people myself and I have asked them, 'Why did they not move over?' And they said they didn't know what to do in that instance," he said. "So they knew that they were supposed to do something but they just didn't know what to do when that actually occurred." Todd Barkalow is the police chief in Freeport, Ill. He says deaths from Scott's Law violations are especially tragic because they're avoidable. He said regional law enforcement hasn't seen an increase in safer driving after these recent deaths. "Even since Trooper Story's tragic accident, they have been writing a lot of tickets, and people are still not moving over and they're violating Scott's law," Barkalow said. "I think as a whole, when we're talking about what's changed traffic wise - The vehicles haven't changed, the speeds really haven't changed. It's the electronic devices, I think, is a huge distraction that we just have to wrap our head around that and come up with some solutions." Barkalow says he'd like to see community members help call out drivers who don't move over with the same urgency as calling out a burglary or shooting. "If people get involved and are willing to come forward and break that culture of silence that suddenly it's come across our nation -- nobody wants to be a rat or a narc or they don't want to tell on somebody. We need the community to help us with all law enforcement," said Barkalow. Violating Scott’s Law can currently result in a fine of up to $10,000. A second House Bill, sponsored by Rep. John Cabello, would make Scott's Law violations even more expensive. Under this bill, first-time violations could still face jail time even if nobody was harmed. Drivers who cause a death could have their licenses revoked permanently. Copyright 2019 Northern Public Radio. To see more, visit Northern Public Radio. The state's heroin crisis has captured headlines and the attention of lawmakers. But in the past few years, the number of methamphetamine lab busts has crept back up, and law enforcement officials say the drug is also coming into the state from Mexico. The Illinois State Police drones have flown nearly 50 missions since May, and the department says they are fulfilling the goal of making police work more efficient.